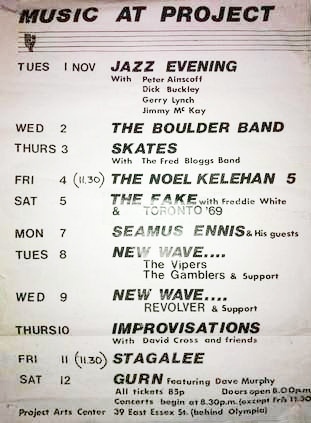 The Gamblers were bottom of the bill at the Belfield Punk Festival in the summer of 1977, supporting Revolver, The Radiators from Space and The Undertones. They also played the Projects Arts Centre in May 1978 with U2 as opening act. Reputedly very good in a Feelgoods/ Hot Rods/ Gorillas vein. Guitarist Phil Fay had a style reminiscent of Wilko Johnson. Was John McMeniman AKA Johnny Ringo? The band also played as The Sole Survivors and The Subterraneans (not the Mother band). Philip Fay was also in The Vultures and Zen Alligators. Pat Pidgeon and Andy Loughran were later in Resisdance.